Around the time you decided to move, you probably also started thinking about whether to do it yourself or to hire a moving company. If you're reading this article, I'm going to assume you haven't quite answered the question yet. To help you out, I've compiled a list of pros and cons to undertaking the do it yourself moving experience. Weigh your options carefully to make a decision that is right not only for your wallet, but for your lifestyle as well. Financial - cheaper than hiring a moving company. Security – you'll keep an eye on your valuables at all times. Convenience – you'll know exactly where each box is when you need it. Peace of mind – you'll be able to relax during the moving process knowing that the difficult labor is left to professionals. Camaraderie – do it yourself moving requires a lot of energy, so you may want to enlist friends to help with the process. Inviting your closest friends to help out will give you a great chance to create memories and spend your last few moments with your closest friends. 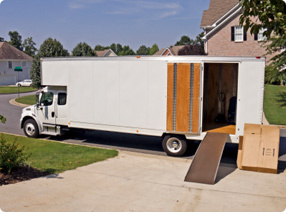 Move on your own schedule – no need to move on the movers' schedule. Ideal for small moves only, as you probably aren't licensed to rent a full-sized moving truck. Time consuming (especially if you're moving a far distance). Not only will it take longer to pack and unpack, but you'll need to drive your belongings on a heavy truck which is a slow process. Risky – professional movers have experience and skill in transporting heavy and fragile items, and insurance for the event that something is damaged during the process. If you break something during a do it yourself move, you probably won't have much recourse to recover the financial loss. May require asking friends for help with the dragging of your things both when packing up and unpacking. If you don't know people in your new town, this may be especially difficult. Difficulty with bulky items and hard-to-reach rooms. Professional movers are trained to fit furniture into windows if the hallways are too narrow and take doors off to get appliances into the necessary rooms. If you don't have this experience, chances are that you won't be able to get your hard-to-fit furniture into your new home. Added stress – the moving process is always stressful, but it's additionally nerve-wracking if you're doing it yourself. If you are the type of person that doesn't work well under pressure, a do it yourself move may not be ideal for you.